6 Things You Didn't Know About Cisco Systems, Inc.
Did you know these six things about the networking giant? Cisco Systems (NASDAQ:CSCO), one of the biggest networking companies in the world, is generally known as a slow-growth company which sells switches, routers, and other networking products. If you had invested just $3,000 in Cisco's IPO in 1990, your position would be worth $1.64 million today and be generating nearly $56,000 in annual dividends. 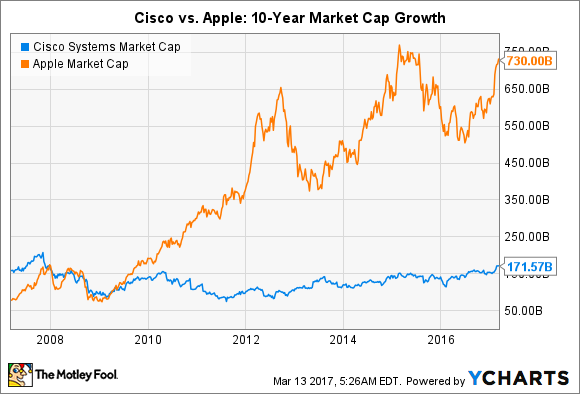 Investors might know that Cisco grew massively in the 1990s and 2000s, and that its revenue growth peaked in recent years. However, investors might be less familiar with these seven lesser-known facts about the networking giant. Bosack and his wife Lerner founded Cisco when both of them were still employed at Stanford. Bosack continued working at Stanford with Cisco co-worker and co-founder Kirk Lougheed, where they developed the company's first router. However, it was an exact replica of Stanford's "Blue Box" router and ran an unlicensed copy of the university's multiple-protocol router software, which was adapted into the foundation of Cisco IOS. In 1986, Bosack and Lougheed were forced to resign from Stanford over the product's development, and the university considered filing criminal charges against Cisco over the theft of its intellectual property. However, Stanford eventually agreed to license its router software and two computer boards to Cisco in 1987. Cisco's price surged to nearly $80 at the apex of the dot-com bubble in March 2000, making it the most valuable company in the world with a market cap of $500 billion. However, that rally wasn't sustainable, since the stock was trading at nearly 240 times earnings. The bubble popped, and Cisco's subsequent plunge made it a cautionary tale of the dot-com bust. Cisco stock never came close to its dot-com bubble levels again. Today, Cisco has a market cap of just over $170 billion and trades at 18 times earnings. The most valuable company in the world today is Apple (NASDAQ:AAPL), which has a market cap of $730 billion and trades at 17 times earnings. Back in 2009, Cisco tried to expand its presence in consumer electronics by buying Pure Digital Technologies, the maker of the popular Flip Video camcorders, for $590 million. At the time, Cisco stated that connecting those cameras to the internet would allow "people to share, publish, and [easily] get access to video," which fit its "vision of visual networking." That proclamation sounded very similar to the strategy GoPro (NASDAQ:GPRO) unveiled five years later. At the time of the acquisition, Flip cameras accounted for 75% of the handheld digital camcorder market. But just like GoPro's cameras, Flip video cameras were gradually rendered obsolete by smartphones -- and Cisco quietly killed the Flip two years later. In 2005, Cisco acquired set-top box maker Scientific Atlanta for $6.9 billion to beef up its video streaming technologies. Those technologies strengthened Cisco's service provider video and collaboration products, but the set-top boxes themselves were a dead weight on its top line growth. That's why Cisco sold the set-top box business to Technicolor for $600 million in late 2015. That's also why Cisco has reported two sets of top line results over the past few quarters. Last quarter, its total revenue fell 3% annually, but only fell 2% after excluding the impact of the set-top box business across all comparable periods. Cisco's fastest-growing business is its cybersecurity unit, which grew its revenue by 14% annually to $528 million last quarter and accounted for 6% of its product revenues. Cisco has been aggressively expanding that business through big investments and acquisitions. It also bundles its security products with its networking hardware and software, which gives it tremendous leverage against smaller stand-alone security companies like FireEye (NASDAQ:FEYE) -- which is frequently cited as a potential takeover target for the company. Cisco may be a "mature" tech stock which is owned for income instead of growth today, but investors shouldn't neglect its colorful history as a Stanford computer science project, the world's most valuable company, an aspiring connected camera maker, and a growing cybersecurity company. These facts indicate that Cisco is much more than a maker of switches and routers, and investors should keep an eye on its investments in other markets.